Sorry for not posting earlier. I have been busy writing my first manuscript and the end of the month had been too busy for me to catch up on review. I also will only be posting one review a week and I will try and see if I can start up the Top Ten Tuesdays again or something else since the 800 Questions for Me posts have been done. 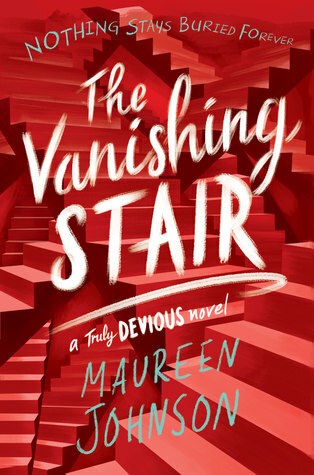 When I finished Truly Devious last year I knew I wanted to read The Vanishing Stair and couldn’t wait. It was worth the wait though and I really liked it. The tantalizing riddles behind the Ellingham murders are still waiting to be unraveled, and Stevie knows she’s so close. But the path to the truth has more twists and turns than she can imagine—and moving forward involves hurting someone she cares for. I give The Vanishing Stair by Maureen Johnson four out of five hearts because I really liked it, but I really would have liked it to be longer and more full of information. This novel is a great sequel to Truly Devious and starts sometime after the previous book, filling in the gap with a few sentences here and there to get the reader up to date. I think the Ellingham mystery will keep me hooked after reading this book. There was so much information in this book to hint at what happened, but it is still not completely solved. There are more pieces from that time and they are great. Also this year there is another mystery for Stevie to solve next to the Ellingham one. Because the girl that disappeared last book still hasn’t been found. I wished there was a little more information given for this mystery, because it now felt a bit like Stevie just stumbled upon it, instead of actually finding info to put her in the right direction. Stevie is still a pretty interesting girl and I would like a little more background information on her, but she really grows from each of the mysteries. Overall I really like this series and would love to read the last book in this series. Maureen’s writing keeps me on the edge of my seat and I don’t want to stop until I have finished the book. This entry was posted in Book Review and tagged Contemporary, Drama, Maureen Johnson, Mystery, Review, Romance. Bookmark the permalink.